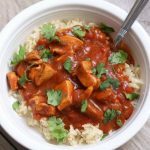 Tender bites of chicken in a tomato sauce with creamy coconut milk. We like to serve this with rice or naan bread. The sauce is so good I could drink it. Turn your Instant Pot to the saute setting. When the display says HOT add in the oil. Add in the onion and saute for about 3-4 minutes. Add in the garlic and saute for 30 seconds. Then add in the tomato paste, ginger, 1 Tbsp garam masala, paprika, salt and chicken broth. Stir. Add in the chicken and tomatoes. Stir. Cover and secure the lid, make sure valve is set to sealing. Set the manual/pressure cook button to 5 minutes on high pressure. Allow the pressure to release naturally for at least 5 minutes and then move the valve to venting. Turn the Instant Pot to the saute setting and stir in the coconut milk. Add in the additional tablespoon of garam masala. If you want to thicken your sauce mix 2 Tbsp of cornstarch with 2 Tbsp of cold water and stir the smooth mixture into the pot. The sauce will thicken quickly. Turn your Instant Pot to the keep warm function. Serve chicken and sauce with naan bread or rice. Chop up cilantro and sprinkle it on top of each dish. Garam Masala–it’s not always at every grocery store. I found mine at Smith’s (Kroger) in the spice aisle and it was the McCormick Gourmet* brand. Chicken–I used boneless, skinless chicken thighs for this recipe. I like this choice best but you can also use chicken breasts. You can use bone-in chicken as well, although I would increase the cooking time to 15 minutes and I would remove the skin so it doesn’t get all soggy. Coconut Milk–I used full fat coconut milk because that’s how I roll. You can also use heavy cream.